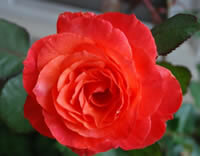 If you are looking for red roses, be sure to check out the Sedona hybrid tea rose. This variety exhibits a peaceful, warm glow with large 5" double blooms with a high center that come in various shades of red, rose, coral, and peach. The Sedona rose is an exhibition quality flower that blooms to release a distinct fragrance of sweet pears. In a cooler climate this rose will display pink and coral hues, but the warmer climates will show the deeper reds. The Veteran's Honor has been called one of the most magnificent roses to ever be used as a tribute to our armed forces and is often found among red rose images. The incredible 5 and a half inch blooms open up into the truest red you may ever see. As the plant matures the blooms will start to soften up into shades of pink. This variety offers sweet raspberry scented flowers that will last as long as two weeks in a vase. 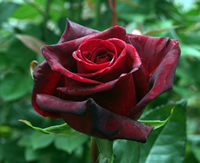 The Black Magic red rose is another very popular rose often found in pictures and images. 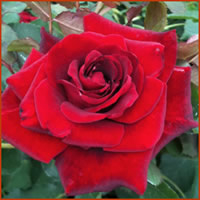 This particular variety was created by crossing the Dallas rose with the red velvet. While they are not actually black per say, they are a deep burgundy color that in certain lighting is often mistaken for black. These are the darkest red roses that have ever been created and this alone perhaps is what makes them so popular. While this is a truly stunning rose, it has often been used in movies as a symbol of death. 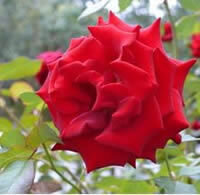 Another enchanting rose that you will often see in red rose images is the Sheer Magic rose. These high center flowers take on more of a pastel look than the deep rich reds of some other roses. The blooms will grow to about 4 to 4.5 inches across and will have a delicate cream color with coral blushed edges. The petals will have a gorgeous satin finish to them from which they get their name. The long stems make them exceptional choices for cut flowers. Another feature which makes this a great variety is the fact that it is highly resistant to black spot. Black cherry roses are very popular among growers because of their deep, rich red blooms that have a slight blackening around the edges of their petals. 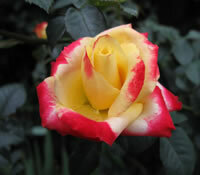 This is a great compact floribunda rose that will simply burst with flowers for most of the growing season. This variety is a vigorous grower and the flowers will have a slight scent of damask. One of the great attributes about the Black Cherry is is highly resistant to disease and it produces foliage of a medium green shade with a nice glossy finish. 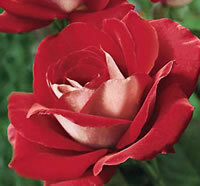 The Ronald Reagan rose was aptly named after one of the most popular presidents of the United States. This exceptional hybrid tea rose produces long and upright stems that will form one of the most unique blooms you might find in a red rose. The bud forms with a whitish pink color that is edged with a deep red tint, making it the reverse of others of its kind. As the petals open up the red continues on the inside while the white stays on the outer side. These blooms can grow up to about 4.5 inches on stems up to 20 inches long. The Don Juan climbing rose is one of the only climbing roses in the world that has its own fragrance, making it a personal favorite of rose growers all over. 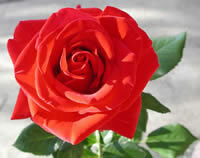 This is one of the most popular roses for red rose images. The velvety, crimson petals will make a dramatic impression and are sure to standout in any garden setting. The blooms form at the end of nice long stems which makes this variety a perfect choice for cut flowers. The plant itself will grow up to 10 to 12 feet tall at maturity in zones 5 through 10, and produce blooms 3 to 4 inches in diameter. The Stairway to Heaven climbing rose is one of the most vigorous climbers you are ever likely to see. This variety will grow extremely fast and it is one of the first roses to start blooming. Once this rose begins blooming, you can expect it to continue blooming from spring until fall with beautiful ruffled blooms that last for a good week or two. At maturity, this rose will grow as high as 10 to 12 feet tall and about 4 feet wide. The blooms will reach about 4 inches or so in diameter. The Crimson Bouquet was one of the AARS's 2000 winners. This grandiflora bush rose grows to about 4 to 5 feet tall with bright beautiful red roses forming on stems 14 to 18 inches long. This rose is hardy in zones 7 through 11 and produces nice double flowers about 4 inches in diameter with petals numbering 20 to 35. One of the key attributes about this particular rose is it is highly resistant to diseases, far above the normal average for most rose varieties. The Lovers Lane red rose is another stunning specimen that is great for pictures and red rose images. This hybrid tea rose produces plush red roses that feature a very distinct silvery highlight on the backside of the petals that offer a nice contrast to the landscape. The blooms form at the end of nice long stems that make them ideal for cutting and putting in vases. This variety is a shrub that will grow about 5 to 6 feet tall and about 4 feet wide at full maturity. The blooms will grow as big as 4 to 5 inches in diameter and on average will have about 35 petals with a slight fragrance.